Firehouse Productions takes on Tony Awards broadcast. New York, NY (July 18, 2018)—For pro-audio enthusiasts, this year’s annual Tony Awards was notable not merely for the long-awaited return of the Best Sound Design categories after a controversial four-year hiatus, but also for the expansion of the wireless audio options provided to the show by Firehouse Productions (Red Hook, NY/Las Vegas, NV). The annual telecast, broadcast live on CBS from Radio City Music Hall in New York, featured vocalists Sara Bareilles and Josh Groban as co-hosts. Show lead Simon Welch and RF coordinator Vinny Siniscal of Firehouse Productions opted to use Shure wireless systems for the event as in the past, but this year added eight channels of Axient Digital with ShowLink for Groban and Bareilles, who used ADX2 handheld transmitters with KSM9 condenser mic elements for the show opener; for their lavaliers, both wore the new ADX1M micro-bodypack. For the rest of the cast, the primary wireless was Shure UHF-R, with 48 channels needed to cover the awards’ many production numbers. All of Firehouse’s 32 UR1M micro-packs were on hand, with handhelds available as needed. In-ear monitoring was exclusively Shure PSM 1000, with 10 mixes available on a total of 32 P10R diversity bodypack receivers. Frequency coordination in the middle of Manhattan is always complicated and the ongoing closing of the 600 MHz range hasn’t simplified that matter. With that in mind, Siniscal limited UHF systems to operating below 608 MHz. This year’s antenna system included three diversity reception zones – on stage, backstage, and audience area. In addition, the system included the Shure ShowLink system with Spectrum Manager for full remote monitoring and control of all Axient Digital functions, including interference detection and avoidance. All Shure systems were monitored by Shure’s Wireless Workbench software throughout the show. The house system is headed by an L-Acoustics rig, with 12 K1s and six K2s per side for the left and right main hangs. Sixteen more K2s go airborne left and right as side hangs, eight KARAs deliver front fill, and 16 KS28 subwoofers in groups of four provide the low end in a cardioid configuration on the floor. If you’ve heard of Fredericksburg, VA-based Salamone’s Recording Studio and are wondering if the Chris Salamone in this report is one in the same, you indeed guessed right. “I’m a live engineer first, 25-plus years and counting, who turned studio engineer along the way,” he explains. “It’s important to make that distinction as they’re two different skill sets entirely as we know, but there’s lots of crossover in how I approach both. “Coming from a musician’s background, coupled with studio background, has really helped with shaping musical elements to fit together in a mix,” Salamone continues. “It’s also taught me the importance of subtractive EQ to carve room for all the instruments to live together and have a place in a recording. In live audio, there are not as many rules in putting together a mix because the dynamic range is wide open. The speakers can handle almost anything you throw at them. In the studio, we have to fit all of the elements into small speakers in order to get it to translate across many listening devices. I use these studio principles live in how I approach EQ, compression, level and panning, and it helps give the arena or room I’m mixing in a focus clear to the back of the room. “This concept hit me years ago in my analog days. I was in one of the worst rooms I’d ever been in and I could not get the band to sound clear through the reflections [of the room]. Yet when I would play program material, the reflections became less apparent making the PA more intelligible. What was the difference? As I studied the reference material, it hit me. It’s the compression and the way it’s being applied that seemed to control the anomalies in the room. This concept of compression, with the combination of physical isolation and manual fader automation, changed it all for me and I’ve never looked back. The tour also employs the talents of guitar techs Frank Robbins and Justin Stabler, drum tech Matt Fowler, keyboard tech Pepe Merconchini, PA tech Chuck Wells, and PA and stage tech Jeff Child. “This is very much a group effort out here,” Salamone notes. A DiGiCo SD10 console working in conjunction with a redundant backup DiGiCo S21 serve Salamone in the house. Both are clocked at 96 kHz. The SD10 feeds a Lake LM44 processor through a pair of AES3 inputs for the left, right, subs, and front fill, while the S21 is also feeding a Lake LM44 through four analog inputs in the same configuration. On the SD10, he uses a redundant pair of Waves SoundGrid Server One machines teamed with MultiRack SoundGrid through the onboard SD10 Waves port. A MacBook Pro is used to control MultiRack SoundGrid and to record multitrack for Virtual Soundcheck through Tracks Live. Both Salamone and Squiers stress that maintaining solid working relationships and communicating with the band are vital to their sound. “They literally help me mix the show,” Salamone confides. “Examples of this would be keyboard parts being pushed (level wise) from stage on a given part of a given song from Charlie DeChant and Eliot Lewis, or getting them to change the parameter of a sound that might in turn change the timbre, which most of the time works better than EQ from the console. There are 50 inputs on stage working with a traditional selection of microphones. Starting in the backline and working toward the front, a Shure Beta 52A [dynamic] is placed outside the kick drum and a Sennheiser e 901 [condenser boundary plate] is inside. Snare top and bottom get a pair of Shure SM57s, while hi-hat and ride utilize AKG C 460 pencil condensers, forming a nice complement for the Shure KSM32 side-address cardioid condenser overheads. The former supplies the desired brightness and the latter brings a darker coloration. An Audix D2 [dynamic] is on rack tom, while Audix D4 dynamics stand in for a pair of floor toms. SM57s once again show themselves for congas and bongos; chimes and toys go with a Shure SM81. Bass DI is a Countryman Type 85, bass mic another SM57. All guitar amps are… you guessed it, SM57s, and the horn mic is an Audio-Technica ATM350 cardioid condenser. Keyboards are direct with more Countryman Type 85s. Backing vocals are all Miktek PM9 dynamics, while lead vocals are captured with Telefunken M80 dynamics. Everything is hardwired. “I’m about spatial depth and imaging,” says Squiers about some of the defining characteristics of his mix, which he creates with the aid of a Yamaha RIVAGE PM10 (“it has girth, sonic quality, dynamics”), three racks of Crown Macro-Tech 36×12 amplifiers (“classic old school at its best, and I’m old-ish, so why not?”), and “Big Red,” an imposing rack-bound collection of outboard gear including his own I/O cage as well as Salamone’s, a splitter, Sennheiser 2050 RF transmitters used in conjunction with the custom Jerry Harvey Audio Lola in-ear monitors worn by every band memer except Daryl Hall (more on that in a minute), and two channels of handheld Shure UHF wireless, only for the times Pat Monahan of co-headliner Train drops in for a guest turn. Hall will not part with his Firehouse 12 wedges. That’s non-negotiable, and right now spans across three different positions on stage – front and center, at his piano, or while he’s on electric keys. “He doesn’t want to wear ears, or a belt pack, none of that,” Squiers relates. “I did wedges for many years before people started shoving things in their heads. It doesn’t bother me. He likes to hear everything. I have a stereo mix in front of him – the outside wedges are left and right, and I pan things accordingly. As for the band members wearing the JH Audio Lola IEMs, Squiers provides vocal prominence for everyone in their own mix, without developing an unhealthy sense of competition. “It seems like everyone sings in this band all the time,” he says. “There are so many harmonies going on in different registers. If I were to try to bring up individual vocals in everyone’s mix, I would wind up creating this volume war. Everyone would be going ‘I can’t hear myself, give me more.’ Each mix needs to be treated as a unique piece of real estate. I can tuck things in a lot nicer that way. There’s a celebratory vibe to the show, with fans embracing both the expected and unexpected. Those who come out to hear powerhouses like “Kiss on My List,” “Private Eyes,” “Rich Girl,” and “You Make My Dreams” won’t be disappointed, plus they’ll hear so much more. 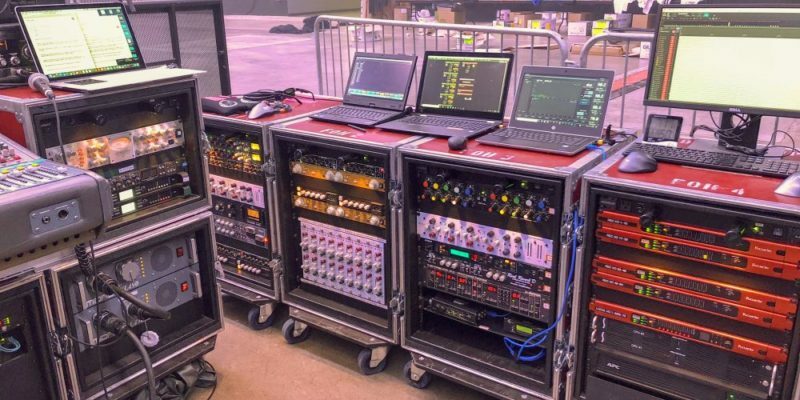 DETROIT, MI – Firehouse Production deployed Focusrite RedNet A16 16-channel analogue I/O interfaces for Jack White’s recent tour with Nine Inch Nails. RAudio-over-IP has proven its worth in countless installed-sound applications. Now, as concert touring has become the single largest source of revenue for most music artists, AoIP (specifically the Dante™ protocol) is going out on the road, saving space, weight and time – all critical elements in the economics of touring – while Focusrite’s RedNet range of Dante-networked audio converters and interfaces is making those audio networks utterly bulletproof. 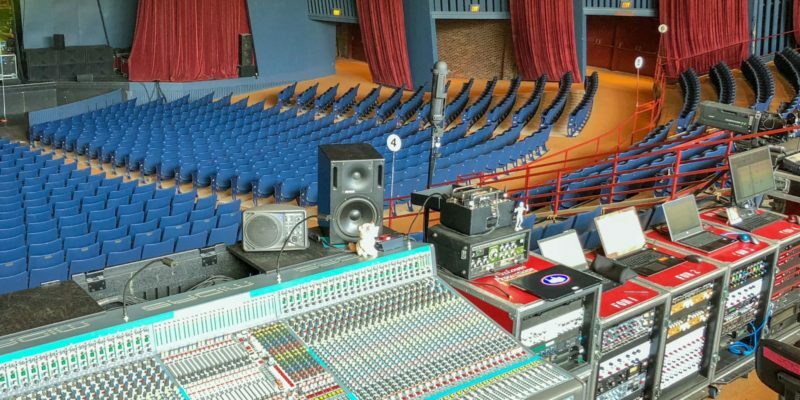 Redhook, NY-based Firehouse Productions has been an early adopter in the transition to Dante and this year has both Jack White and Nine Inch Nails on tour using AoIP systems they’ve built using RedNet components. Lorde’s Melodrama tour is the first international tour to use L-ISA technology. L-Acoustics applications engineer Jesse Stevens and Firehouse Productions systems engineer Michael Gazdziak talk about the L-ISA configuration and how easy it was to load in and set up night after night.